Russia's currency reserves, the third-biggest in the world, are falling steadily as tumbling oil prices and an exodus of capital are piling the pressure on the central bank and government policymakers to accept a devaluation in the ruble. Oil prices which are now down 60% from their july peak, slowing economic growth and increasing investor concern are steadily draining Russia's foreign exchange reserves, which fell 19 percent (to $484.6 billion) in the 12 weeks through Oct. 31. This is down from $598.1 billion in the week before the invasion of Southern Ossetia. Russia had been using the reserves to try and contain the upward movement in the ruble was thought to present a threat to the competitiveness of exports. But resistance is now becoming increasingly difficult in the fact of a 13 percent drop against the dollar since August 1.
currency basket comprised of about 55 percent dollars and 45 percent euros. Evidently the main responsibility for the drop in the ruble has been a change in the relative values of the currencies in the basket, with the euro falling significantly against the dollar. The central bank sold a record $40 billion in October, according to Moscow-based Trust Investment Bank, while Troika Dialog, the country's oldest investment bank, have warned that the currency may fall by as much as 30 percent in the event of a devaluation. The logic behind any impending devaluation would not be too hard to find either. 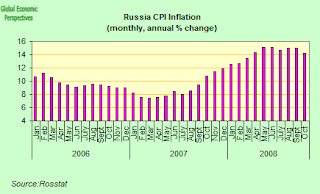 Try looking at the inflation bonfire which has been allowed to rage in Russia over the last eighteen months. 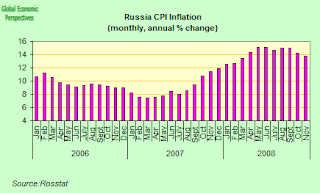 Russia's inflation rate fell to 14.2 percent, the lowest in seven months, in September as grain, legumes and gasoline prices all decreased. 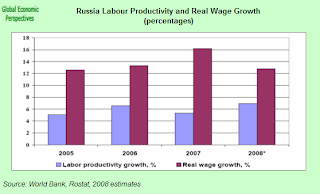 The rate dropped from 15 percent in September, according to data from the Moscow- based Federal Statistics Service. Prices were up 0.9 percent on the month, after rising 0.8 percent in September. Bank Rossii, Russia's central bank, may have to increase the "flexibility'' of the ruble exchange rate, and this will involve a "certain tendency toward weakening'' according to bank Chairman Sergey Ignatiev speaking on state television Vesti-24 last week. Russia may "gradually'' widen the trading band if the current account falls into a deficit next year, according to Arkady Dvorkovich, an economic adviser to President Dmitry Medvedev, recently. And Russia's current account, the widest measure of flows in goods and services, seems now to be inexorably headed toward just thatdeficit. Russia's trade surplus narrowed to $16.4 billion in September, from $18.5 billion in August, according to the latest data from Bank Rossii . Russia's benchmark 30-year government bond has fallen substantially in 2008, pushing the yield to an almost seven-year high of 12.55 percent as of Oct. 27. So far this year, the RTS Index has lost 64 percent, and is headed for its worst performance since 1998. VTB Group, Russia's second-biggest lender, has lent 377 billion rubles ($14 billion) to Russian companies since the beginning of September. The state-run bank provided 120 billion rubles worth of loans in September, 229 billion rubles in October and 28 billion rubles in the first week of November. Most of the money was leant by VTB (94 billion rubles) to metals companies. This was followed by 33 billion rubles for the power industry and 32 billion rubles for retail companies. The bank increased its corporate loan portfolio to 667 billion rubles in the first 10 months of 2008, from 363 billion rubles in the same period last year, according to the bank. The bank has also increased its retail loan portfolio by 183 billion rubles, a 97 percent increase from the first 10 months of 2007. 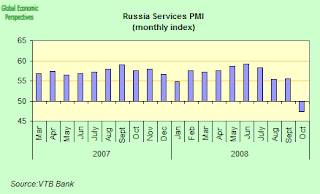 Russia's service industries contracted in October for the first time in more than seven years as the effects of the financial crisis spread into the real economy. 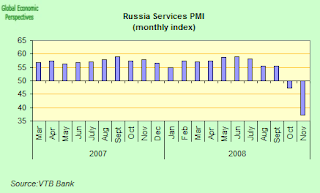 VTB Bank Europe's Purchasing Managers' Index of growth in services fell to 47.4 from 55.5 in September. A figure below 50 shows a contraction. If we put this chart alongside the October manufacturing PMI one, it is clear that something significant happened in October. If things continue this way we are heading straight for recession I would say. The ruble declined 1 percent to 30.6879 versus the basket as of 1:30 p.m. in Moscow. Against the dollar, it was at 27.3040 having earlier slid by as much as 1.3 percent to 27.3975. It was 1 percent weaker against the euro at 34.8484 per euro. In other news Fitch Ratings yesterday followed Standard & Poor's and lowered the outlook for Russia's credit rating to negative, while Bank Rossii today set a limit of 10 billion rubles ($366 million) on the amount of so-called currency swaps it offered. The swaps allow traders to bet on the exchange rate without having to sell rubles. The central bank started curbing swaps on Oct. 20 in theory to deter "speculators". Among the falling stocks were those of OAO Sberbank, which dropped sharply after Vedomosti reported that Russia's largest savings bank had suffered a record $3 billion of withdrawals from retail accounts in October. Sberbank, which is the biggest holder of ruble deposits, fell 3.2 rubles, or 10 percent, to 27.63 rubles on the Micex Stock Exchange. Retail clients of Russia's biggest bank withdrew 80 billion rubles ($3 billion) in October, a record amount for a single month, Vedomosti reported, citing an unidentified person familiar with the bank's accounts. Central bank Chairman Sergey Ignatiev estimated yesterday said net private capital outflows reached $50 billion in October. Russia's central bank lifted its key policy interest rate to 12 percent from 11 percent after the market closed yesterday. The move is widely interpreted as an attempt to stem the massive outflow of funds. The central bank also widened its trading band target by 30 kopeks (1 cent) yesterday, a move which "achieved almost nothing'' and cost the best part of $7 billion of the nation's foreign-currency reserves, according to analysts at Renaissance Capital. Russia has thus joined central banks in Hungary, Iceland and Pakistan in raising interest rates to stem currency losses while the rest of the world cuts benchmark levels to try to promote lending. 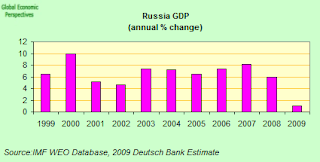 The cost of protecting against a default by Russia also soared after the decisions were announced. Credit-default swaps on Russian government bonds jumped to 7.17 percent of the amount insured from 6.14 percent yesterday, according to CMA Datavision prices. The yield on its 30-year dollar bonds increased to 10.77 percent from 9.1 percent. The ruble fell back 1 percent yesterday, the biggest daily drop in two months. 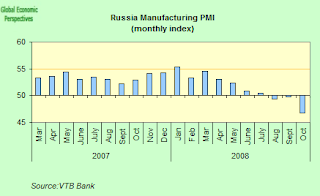 Russian manufacturing contracted in October at the slowest pace in over two and a half years as the global financial crisis cut demand, according to the latest reading on VTB Bank Europe's Purchasing Managers' Index, which fell to 46.4 from 49.8 in September. 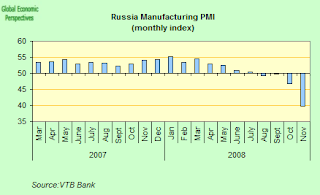 This was the third consecutive month in which Russian industry has been contracting. A figure above 50 on these indexes indicates growth, while one below 50 means contraction. The total assets of Russia's combined oil funds rose 4 percent - to $197.4 billion - in October after the transfer of taxes from oil revenue, according to data from the Finance Ministry. The National Wellbeing Fund held 1.7 trillion rubles as of November 1, equivalent to $62.8 billion, while the Reserve Fund held 3.6 trillion rubles, or $134.6 billion. Russia transfers a part of its oil and gas revenue to its two oil funds, which were created after the Stabilization Fund was split in two in February 2008. The Reserve Fund may, by law, only invest in foreign government bonds. Initially funded with just $32 Billion starting, this fund could increase dramatically in the future if oil prices start to rise again. The fund will mostly be managed by the Russian Ministry of Finance. The fund also has the ability to lend money to Russian banks. Furthermore the Fund is intended to serve as a tool for absorbing excess liquidity, in order to try to reduce inflationary pressure as well as insulate the economy from volatility in oil & gas export prices. The fund may invest in riskier assets, such as corporate bonds and possibly, at some point, equities. The Russian state banks VEB and Sberbank are to get funds from the National Wealth Fund to place on deposit until 2020 as part of the recent plan to rescue the country's financial sector. The draft of the new law states that Sberbank will get a subordinated 500 billion rouble ($19.11 billion) loan at an annual interest of 8 percent and will issue a bonds to guarantee it. VEB will get the money from the National Wealth Fund at a rate of 7 percent a year and will provide loans to state bank VTB, and other banks and companies at 8 percent a year. In line with this decision 170 billion rubles from the Wellbeing Fund ($6.3 billion) were last week deposited with the state development bank, Vnesheconombank. Russia has pledged a total of more than $200 billion to replenish liquidity and help companies overcome what is evidently now the worst financial crisis since the 1998 default on sovereign debt. The Russian government has said it will transfer 450 billion rubles from the Wellbeing Fund to Vnesheconombank, known as VEB, at an annual interest rate of 7 percent until 2019 for providing subordinate loans to banks. A further 175 billion rubles will be transferred from the fund at the same interest rate through 2013 to support local securities. Of the money deposited with Vnesheconombank, 125 billion rubles will go toward subordinate loans and 45 billion will be invested in Russian stocks and bonds. Russia's oil production continued to fall in October - dropping for the 10th consecutive month - as producers struggled with rising costs and maturing fields, bringing the world's second-biggest crude exporter closer to its first annual drop in output since 1998. Output fell 0.7 percent compared with a year earlier to 9.87 million barrels of crude a day (41.7 million metric tons a month), according to figures released by the Energy Ministry. Output in Russia's oil heartland of western Siberia is sagging as older fields mature and producers are forced into remote regions to tap deposits. Oil companies need credit lines totaling $100 billion to make investments endangered by the global financial crisis, according to the Vedomosti newspaper, which cited a letter from Deputy Prime Minister Igor Sechin to President Dmitry Medvedev. The ruble suffered its biggest monthly decline against the dollar in nine and a half years in October. Investors took $72 billion out of Russia during October, and have now taken around $140 billion since early August, according to estimates by BNP Paribas, while the Micex Index dropped 30 percent and pushed the yield on the 30-year government bond to a seven-year high. The currency, which the central bank manages against a basket of dollars and euros, weakened 1 percent to 27.0955 per dollar last Friday, taking its decline on the month to 5.6 percent, the most since March 1999. Bank Rossii, the central bank, buys and sells foreign- currency reserves to keep the ruble within a trading band against the basket. The mechanism comprises about 55 percent dollars and 45 percent euros and is used to protect the competitiveness of Russian exports from currency swings. The ruble fell 0.2 percent to 30.4036 versus the basket, from 30.3512 yesterday, and was little changed from 30.3675 at the end of September. Bank Rossii - the Russian central bank - sold $40 billion in October, a record, to prevent the ruble from weakening beyond 30.40 to the basket. During the third week in October alone Russia's reserves dropped by $31 billion (another record) according to data from the central bank.